Digital transformation and increasing adoption of cloud service means even small and medium-sized organizations are finding themselves with multiple legacy systems. Integrating them with the latest applications in mobile, social, cloud and big data often makes more sense than completely overhauling or replacing large applications. However, these integrations must be done carefully to assure the high-performance benefits of modern applications are maintained. The Supra ITS systems integration framework can unify applications, databases and legacy systems across your organization, so you can take advantage of modern cloud applications while meeting your business-specific goals. Our middleware expertise provides customers with an effective integration architecture that speeds up time to market informed by our competencies in proprietary and open source technologies and our partnerships with major enterprise software vendors such as Oracle and Microsoft. Our intra-enterprise and legacy systems integration offerings include architecture design and consulting, customized application integration, migration and consolidation, Service-Oriented Architectures and web services, and business process integration. Supra ITS’ systems integration approach to linking disparate applications enables you to unlock the data contained in legacy siloes to create a seamless user experience. This improves productivity and responsiveness while streamlining interaction between suppliers, partners and customers. 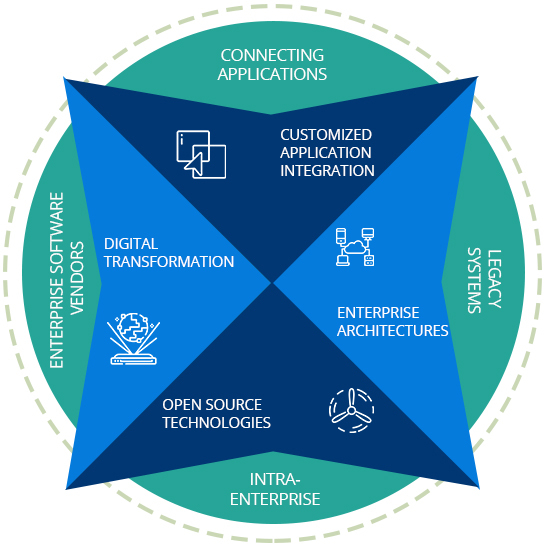 Application integration plays an essential role in your digital transformation efforts as you update your IT environments and enterprise architectures. Supra ITS system integration expertise enables you to connect SaaS and other cloud-based applications with legacy elements such as mainframes, packaged and custom applications, and databases. Our integration framework enables you to easily manage the exponential growth in data, devices and services in alignment with your business needs and commitments to your customers.